It's prom time, and that means it's time for students from Western's Schulich School of Medicine & Dentistry to pair up with seniors from Grand Wood Park Apartments & Retirement Residence for London's most unusual formal. The 8th annual Spring Intergenerational Gala will be held on Sunday, May 6th from 5:00 to 8:00 p.m. at the Best Western Lamplighter Inn. 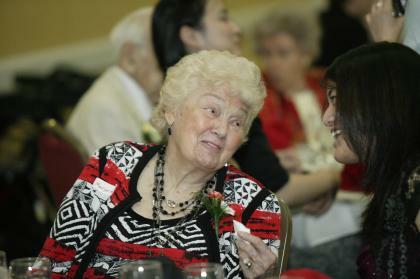 This event has drawn national attention for its unique concept of pairing students and seniors as dates. The Gala encourages medical students to consider geriatric medicine, while providing an opportunity for intergenerational understanding and friendships. It helps both medical and dental students to see their elders not simply as patients, but as people first. Seventy-five couples are attending. "As a past attendee of the Gala, I can attest to the wonderful social opportunity that it provides for both the student and resident attendees," says Robyn Sambrook, one of this year's IGG organizers. "It is a unique and valuable experience that bridges the age gap, giving everyone perspective and insight into the lives of a different generation." "The Gala truly represents the philosophy that we embrace at Grand Wood - that retirement living is about continuing to learn, explore, celebrate, grow and of course have fun," says Tanis Siddique, the General Manager at Grand Wood Park Apartments . "This program provides our residents with an unforgettable opportunity to share their knowledge and life skills, with a truly remarkable group of medical and dental students." The Gala features dining, dancing and music. Live entertainment will be provided by the Schulich Choir and Orchestra, and the phenomenal senior music and comedy troupe, Nostalgic Theatre.